The instrument is made up of two superimposed disks of different diameters. The larger disc bears the signature of the instrument maker Charles Whitwell on its back, as well as a slot which may have been used for a stand. The two disks are fixed together by means of four half-circles which can be superimposed, crossed, rotated and inclined. 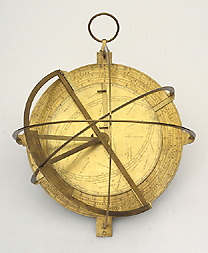 The nautical hemisphere, which originated in the bequest of Sir Robert Dudley, is depicted in Dudley's Arcano del mare, and was probably used for calculating the tides.